Hernan Cortes was a Spanish conquistador who undertook the journey to Mexico where he defeated and ended the Aztec Empire and subdued a major portion of Mexico in the first quarter of the 16th century. He landed at Mexico in 1519 and within a few years, had established his hold on most of the region. The Spanish King then appointed him as the governor of Mexico. Hernan Cortes was born in 1485 and hailed from the lesser nobility of Spain. He spent most of his life away from Spain and was interested in exploring the New World. In 1519, he was able to secure an army and the means to explore Mexico which he effectively brought under the control of Spain. He later returned to Spain and Charles V received him with honour but his administrative powers in Mexico were diminished and when he returned to the conquered land, he had to face an adverse administration. Hernan Cortes The Conquest of Tenochtitlan – In 1520, he laid siege to the Aztec capital of Tenochtitlan and was successful in conquering it by 1521, bringing an end to the Aztec Empire. Hernan Cortes was given the charter to explore Mexico in 1518 but the charter was revoked at the last minute. Disobeying the revoking, Cortes left for Mexico with soldiers and ships. He landed in Yucatan Peninsula in 1519. This was Mayan territory which he effectively invaded and proceeded to Tabasco where he won an important battle. In 1520, he laid siege to the Aztec capital of Tenochtitlan and was successful in conquering it by 1521, bringing an end to the Aztec Empire. 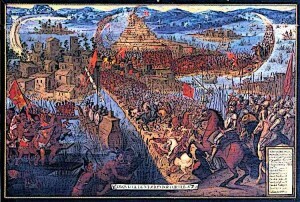 In August 1519, Cores marched with most of his army to the city of Tenochtitlan. On the way, he had to fight with Otomis and the Tlaxcalans but he was able to win them as allies in the fight against Tenochtitlan. 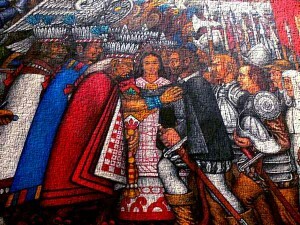 In November, Cortes reached Tenochtitlan with his army and was received by the Emperor Moctezuma II. Meanwhile, some of Cortes’ soldiers at the Veracruz coast were killed by Aztecs, so he took the King hostage in his own palace. Ultimately, this led to the death of the king, the massacre at the Great Temple and the flight of Spaniards from Tenochtitlan who sustained major losses. 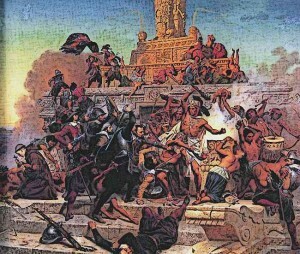 During the initial retreat from the city of Tenochtitlan, Cortes’ army sustained heavy losses and lost a major portion of the treasure it had gathered so far. Rallying the support of native allies, Cortes returned in 1520 to lay siege to the city and after the capture of its ruler in January 1521, effectively gained the control of the city of Tenochtitlan. During the siege, many parts of the city faced destruction and ruin. After the conquest of Mexico, Cortes wrote to the King of Spain to send friars to Mexico, stating that the vast indigenous populations had to be converted to Christianity. In May 1521, a group of twelve Franciscans arrived in accordance with this request and began the Christianising of the region. Cortes himself was personally interested in having the local populations converted to Christianity. Hernan Cortes Spanish Conquest of Aztec Empire – During the initial retreat from the city of Tenochtitlan, Cortes’ army sustained heavy losses and lost a major portion of the treasure it had gathered so far. After he had the entire Mexican territory under his control, Cortes was awarded the governorship of the new territory. He was also awarded the title of the chief justice and captain general of these territories. However, the Crown also appointed four other royal personnel as part of the administrative body which dismayed Cortes. During his governorship, Cortes began the construction of Mexico City on the ruins of Tenochtitlan. Hernan Cortes and his army first made landfall at Cozumel, which fell within the Mayan territory and after a brief stay, moved to the Mayan city of Pontanchan. Here he quickly won a battle against the Mayans who paid tribute to him, which included Marina, the woman who was to be Cortes’ lifelong mistress and interpreter throughout his Mexican exploits. After the conquest of Aztec Empire, he again moved on the Mayan lowlands between 1524 and 1525, aiming to subdue a rebellious Spaniard. On this expedition, he was able to expand the influence of Christianity in Mayan lands. The Spanish King granted Cortes a coat of arms on 1525 which reflected his exploits well. It comprised of a shield divided into quadrants and included the representation of the Empire as a black Eagle with two heads, the golden lion on the red field depicting Cortes himself and depictions of the conquered city of Tenochtitlan and the three Aztec emperors defeated by Cortes. Cortes was successful in bringing about the end of the Aztec Empire at the time of its peak as well as the end of the Mayan Empire in its Post-classic period. On the behalf of the Spanish Empire, he was able to bring the entire area of Mexico under his control. His “spiritual conquest” of Mexico comprised of bringing the native population under the influence of the Church which worked with him to convert the populace to Christianity. Hernan Cortes was first married to Catalina Suarez in 1522, the kinswoman of the Cuban governor whom Cortes had defied in undertaking the Mexican conquest. He had no children from this marriage, although he had sired many children in his illegitimate relationships. Suarez died later in 1522 under mysterious circumstances. In 1529, he married Spanish noblewoman Dona Juana de Zuniga and had three children from this marriage. In 1547, Cortes was disillusioned with the Crown’s treatment of him and decided to return from Spain to Mexico. On the way, he contracted dysentery and finally died in Seville in December, 1547. At the time of his death, he had given up exploration altogether following many unsuccessful attempts which incurred a significant debt. However, he still died a rich man leaving significant estates and riches to his heirs. Hernan Cortes was a Spaniard conquistador who undertook the exploration of the Mexican region in 1519. Cortes did so in defiance of the Crown’s appointed officer, the governor of Cuba. However, he was able to reach Mexico and bring about the end of the Aztec Empire through a series of strategic alliances and battles. Ultimately, the crown acknowledged his conquests and he was made the governor of Mexico. During his reign, he built Mexico City on the ruins of Tenochtitlan.